Virus diseases, particularly those caused by the grapevine leafroll associated viruses (GLRaV) and grapevine red blotch-associated virus (GRBaV), are a serious threat in all Canadian wine producing provinces due to their rapid spread and severe impact on grape and wine production and quality. Activities in this theme will determine the incidence of virus infections across Canada, the role insect vectors and their control play in infection spread, and the virus impacts on grape yield and quality. This activity continues work performed under a BC GF2 AgriInnovation Program with increased focus on the role of vectors in the spread of leafroll and red blotch viruses and on long term mitigation. Small lots of wine will be made from infected plants to assess impacts on wine sensory attributes that will be validated by sensory panels. From nursery to vineyard: implementation of effective management strategies against grapevine trunk diseases in Canada Objectives: 1. Management of GTD in nurseries and young vineyards a) investigate non-destructive methods and evaluate molecular tools to efficiently detect Grapevine Trunk Diseases (GTD) pathogens in nursery material; b) evaluate the status of domestic and imported nursery material with regard of GTD; c) determine abiotic stress factors favoring GTD development in newly established vineyards. 2. Management of GTD in mature vineyards. a) investigate and implement novel and existing chemicals and/or biological control agents against GTD; b) investigate and implement best cultural practices to mitigate GTD under BC growing conditions. UPDATE JAN 2019: The attached document summarizes the Plant Pathology laboratory’s past and future research on grapevine trunk diseases in British Columbia, one of the major problems the industry is currently facing. This article reviews the work conducted to develop and implement effective management strategies against these diseases in Canada. The BC Wine Grape Council has participated in funding research at UBCO to develop methods to identify regionally-specific molecules involved in smoke residues so as to allow producers to predict degree of smoke taint in wine from the chemical composition of smoke-exposed berries, thus enabling them to minimize economic and quality impacts of smoke exposure. We feel this work has significantly contributed to the body of knowledge concerning the chemistry of smoke taint in wine. Smoke taint has been identified by the industry members of the BCWGC R&D Committee as a high priority research subject. What we have found from past experience and literature search is that smoke taint in wine arises from very close exposure of vines to wildfire at very specific stages in berry development. Currently we do not expect to see significant widespread impact from the 2018 wildfires. Supporting documents related to this project are shared in the links below. In white wines, the wine aroma plays a major role in determining wine quality and economic value. In many grape varieties cultivated in BC, the aroma makeup is built in the vineyard where key aromatics accumulate in the grapes. Irrigation and crop size adjustments are two main strategies that growers have adopted to manage fruit ripening and composition. Both strategies have been largely used as a tool to improve the composition of red grapes but very limited information is available on the impact of these strategies on the accumulation of aromatics in white grapes. This project aims to evaluate the effect of deficit irrigation and crop size adjustment strategies on the concentration of aromatics in white grapes and wines. The goal is to develop an irrigation and crop size adjustment strategy that maximizes the level of aromatics produced in white grapes cultivated in BC while minimizing water demands. New vineyard irrigation regimes will be developed that simultaneously enhance environmental sustainability and fruit quality for winemaking. The regimes will be tailored to selected rootstocks and will combine drip and sprinkler irrigation to conserve water, enhance the growth of floor vegetation to reduce pest and disease incidence, and promote a healthy soil microbial ecology. This research activity will also establish large long-term research plots for demonstrating to industry the responses of Merlot and Chardonnay winegrapes to combinations of rootstocks, irrigation regimes, and mycorrhizal inoculations. The biggest threat to Canada’s V. vinifera premium wine industry is from extreme cold weather events during which temperatures colder than -20˚C can severely damage or kill grape buds and vines. A 2009 survey of winter damage in the Okanagan and Similkameen valleys found that cold injury levels ranged widely for many varieties in response to minimum temperature exposures. We will evaluate the levels and variation in winter hardiness levels in the major grape varieties grown in the Okanagan and Similkameen valleys during the dormant period from leaf-fall to budbreak, and will elucidate factors in vineyard management and site conditions that affect cold hardiness. From these results, vineyard management practices that maximize grapevine cold hardiness will be recommended to industry. UPDATE FEB 2019: The attached article offers a glimpse into our wine-grape cold hardiness program. It describes the work involved in producing the biweekly hardiness reports, and some of our research goals. This study is working towards the long term goal of finding effective management strategies of the major grapevine trunk disease (GTD) pathogens found in British Columbia, as well as those that may be imported in nursery material. Epidemiological studies and implementation of DNA-based molecular diagnostic tools for a rapid and precise detection of all fungal species associated with GTD will facilitate the effective investigation of control strategies. The sustainability of the wine grape industry also requires the importation of healthy vines as part of a practical disease management strategy. Therefore, the development of a comprehensive disease control strategy will be investigated for both commercial vineyards and nurseries. Grapevine leafroll associated viruses (GLRaV’s) occur in all major grape producing regions of the world, causing delayed ripening and reductions in yield and fruit quality. These negative impacts on grapevines are of particular concern to the BC wine and grape industry due to the short growing season and an emphasis on production of high quality fruit. This study will provide critical information about the occurrence of the various GLRaVs and their insect vectors in BC vineyards and determine their effects on vine growth and fruit and wine quality under cool temperate conditions. Dr Tom Lowery and Dr. Jose Urbez-Torres, Agriculture and Agri-Food Canada, Summerland Research and Development Centre. Vineyard groundcover vegetation can influence the growth of grapevines by competing directly for water and nutrients, or conversely by providing nitrogen in the case of legumes. Selection of vineyard groundcover species with beneficial properties requires consideration of differences in growth habit, drought tolerance, and the ability to withstand mowing and vineyard activities. Previous research has shown that increasing plant diversity, particularly the presence of winter annual mustards in the vine rows in spring, contributes to the management of grape pests. Increasing use of drip irrigation and a desire to include flowering plants that provide shelter and alternative sources of food for beneficial insects favours the use of locally adapted native species, but little is known about their growth characteristics and suitability for the vineyard ecosystem. This research will investigate the suitability of a variety of native and non-native groundcover species, assess their impact on populations of grape pests and beneficial insects, and evaluate their effects on vine growth and fruit quality. Methoxypyrazine (MP) in minute quantities can greatly affect the vegetative character and overall quality in some wine grape varieties. Results from the past three years show that higher rates of nitrogen and the timing of applications impact MP levels in Cabernet sauvignon and Sauvignon blanc, two important varieties for the BC wine industry. We found that higher rates of nitrogen applied early in the season result in higher levels MP. The primary pyrazine is IBMP which is a bell pepper aroma remains above sensory threshold levels to maturity. We have found that pyrazine level can be altered by up to 40% through manipulating nitrogen applications between bud break and veraison. Dr. Kevin Usher, Agriculture and Agri-Food Canada, Summerland Research and Development Centre. Overcoming critical plant nutrient limitations currently inhibiting healthy vine growth and production of high quality wine. This project examined several aspects of grapevine nutrition that impact the health of the vine, the quality of the wine and the quality of the environment. Dr. Gerry Neilson, Agriculture and Agri-Food Canada, Summerland Research and Development Centre. The effects of irrigation regimes combining different rates, frequencies and emitter densities were studied to find optimum regimes that lead to high fruit quality and water use efficiency while reducing excess stress and crop losses due to winter injury. Experiments were conducted with Merlot and Pinot gris on coarse textured (sandy soils). High frequency irrigation reduced vine stress while improving water use efficiency, and fruit quality by enhancing skin tannins and reducing berry pH while maintaining crop yields. Reducing the irrigation rate to a moderate deficit also increased water use efficiency but reduced crop yields, fruit soluble solids (brix), juice TA and skin tannins, and increased juice pH. The only benefit of the reduced irrigation treatment was a slight enhancement of berry anthocyanins. Reducing emitter density to give longer, deeper penetrating irrigations increased crop yields and water use efficiency but had no other effects. Sensory analysis of wines made from Pinot gris showed that more frequent irrigation enhanced wine body and fruit flavour. Dr. Pat Bowen, Agriculture and Agri-Food Canada, Summerland Research and Development Centre. Develop better basic understanding of livestock, poultry, honeybees and crop biology as a foundation for the development of integrated crop and livestock production systems; Development of molecular genetic tools, including: identification of genetic markers for disease and pest resistance, quality and other desirable traits to improve crop production profitability. Dan O'Gorman, Agriculture and Agri-Food Canada, Summerland Research and Development Centre. Develop crop production systems to enhance producer profitability by decreasing risk, decreasing cost of production and improving overall economic and environmental sustainability. Develop management practices and standards to promote plant health are developed. Dr. Tom Lowery, Agriculture and Agri-Food Canada, Summerland Research and Development Centre. A conceptual model developed by PARC researchers (see below) has formed the basis of GIS research to find viticultural and enological practices that optimally interact with terroir to maximize vineyard performance. New components to be added to the model are in keeping with the BCWGC’s new Sustainable Practices initiative. These include the natural ecology within and surrounding vineyards as components of terroir; and environmental sustainability in equal partnership with economic sustainability as performance goals of viticulture and enology (management). In previous GIS research conducted by PARC researchers a database was developed for Okanagan and Similkameen valley vineyard varietal blocks and their associated terroir and viticultural characteristics (Bowen et al. 2005). Through analyses of these data, growing regions (sub-appellations) were defined and influences of management practices and terroir on fruit and wine quality were revealed. Other outputs of the research included definitions of varietal suitability to growing regions; effects of terroir and management on fruit composition and wine flavour and aroma; and provision to growers of vineyard maps overlain with soil characteristics to guide irrigation and fertility management (Bowen 2006). A demonstration of distinct differences in flavour, aroma and mouth-feel of Merlot wines due to region of origin was one of the first scientific analysis worldwide clearly demonstrating terroir influences on wine sensory quality. Dr. Pat Bowen, Agriculture and Agri-Food Canada, Summerland Research and Development Centre. We propose to: (1) evaluate the responses of four rootstock options to five combinations of Okanagan nematode species-populations, and (2) characterize the influences of compost soil amendments on the nematode-root interaction for resistant and susceptible rootstocks. The proposed research will be one component of a co-ordinated BC-Pacific Northwest regional collaborative research effort. The overall goal of the collaboration is to better understand the pathogenicity of plant parasitic nematodes found in vineyards in the region, extrinsic factors affecting their pathogenicity, and rootstock resistance. Recently, there have been reports of vines with poor vigour and weak growth, which may be a result of nutrient deficiency, compounded by overcropping. Low vigour can also be a consequence of excessive root damage, resulting from soil nematodes. This project will correlate vine nutrition and quality of grapes in a number of soils in the Okanagan/ Simlkameen and determine if nematodes play a role in vines showing poor vigour. For full details view attached file. The effects of application and removal timing for polyethylene vine canopy enclosures (sleeves) was studied in two Okanagan Valley vineyards. For full details view attached files. Registration of new pesticides is required for the continued viability of the grape and wine industry in BC. Many insecticides formerly used on grapes are no longer available, are ineffective, or cause outbreaks of secondary pests such as mites. Reliance on broad-spectrum, highly toxic insecticides also runs counter to the image that the B.C. grape and wine industry hopes to cultivate. During this two year study we will evaluate the efficacy of a number of new, reduced-risk insecticides (e.g. oil, neem, Applaud, Rynaxypyr, Success) for the control of cutworm, leafhoppers and thrips, and determine effects on populations of beneficial insects. Treatments will be applied to plots of grapes at PARC in collaboration with Karen Bedford, Minor Use Coordinator. Evaluation of oils also involves assessment of possible effects on vine growth or maturation of fruit. Research will be conducted to determine interactions among environmental conditions (soil and climate), irrigation and N fertilization levels, and canopy management methods that influence wine grape quality. The goal of the research is to determine whether a decline in canopy performance due to stress resulting from water and N deficits delays maturation and reduces fruit quality. The research will be conducted at two or three commercial sites differing in climate and soil texture. Canopy growth and performance (photosynthesis), and fruit microenvironment will be monitored over the growing season. Yield and its components and fruit compositional quality, including methoxypyrazine, will be determined. Beginning in the second year, small-lot wines will be made from selected treatments and will undergo compositional and sensory analysis. Additional complimentary basic research on leaf and fruit ABA levels, fruit phenolics, and mesoclimate characterization will be conducted under our AAFC-funded program. The results will be used to make site-based recommendations for irrigation, N fertilization and canopy management that will optimize vine vigour and canopy performance. Recent experience and research with hot water treatment protocols for imported grapevines have found that handling and storage procedures before and after HWT can influence vine vitality after planting. We plan to conduct an experiment using young Merlot and Chardonnay vines on 3309 rootstock that will be subjected to combinations of handling treatments including hydration in storage, pre- and post-HWT acclimation, and post HWT cold storage. There will also be a set on vines without HWT that will undergo some of the same handling treatments for comparison. After treatment, the vines will be planted at the PARC field plots facility and evaluated for budbreak timing, mortality rates, and growth and development for more than a year. The results will be made available to growers and nurseries to clarify what combination of HWT procedures best maintain vitality in young vines. Insect and Mite Pests of the Grape of the Southern Interior of B.C. 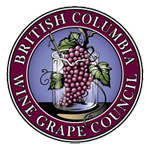 This publication is a companion to the Management Guide for Grapes for Commercial Growers, British Columbia Wine Institute, Kelowna BC. For full details view attached file. Insecticides are not always effective for the control of cutworms, and their use often reduces numbers of beneficial insects that help control secondary pests. Alternative methods of control are required in order to prevent excessive levels of damage while maintaining numbers of natural enemies. Past research has shown that timing of weed control in spring and the presence of certain broadleaf plants greatly affects levels of damage. Stands of shepherd’s purse and other mustards is associated with reduced feeding, while removal of broadleaf plants in the vine rows prior to shoot elongation results in more damage. It appears, therefore, that manipulation of ground cover vegetation might be used to effectively manage cutworm damage. In this three year study we propose to evaluate mustards to control cutworms and nematodes, and will also study effects on nematodes and vine physiology. (In cooperation with Simon Fraser University, Phero Tech and Dr. John Borden - PARC Agassiz) They will identify and synthesize all pheromone components of this click beetle to be used as an attractant for monitoring and possibly also controlling populations through mass trapping, mating disruption or “attract and kill” devices.